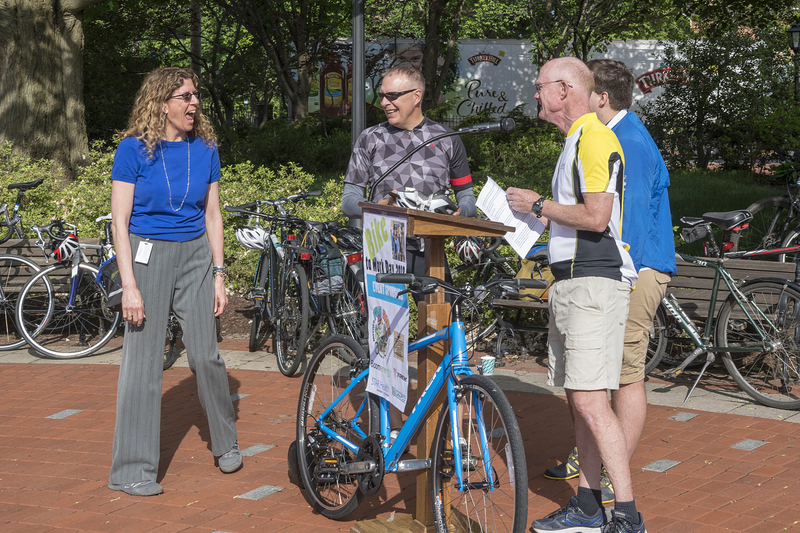 Newark celebrated National Bike to Work Day on Monday, May 21, the event having been rescheduled from May 18 due to rain. The first sunny day in a week saw more than 70 riders converge on Mentors’ Circle on the University of Delaware campus for the early morning event. Though ridership was a bit off what we’d experienced over the past couple years, the event enjoyed great support in terms of sponsorships, which allowed us to this year to include a “grand prize” of a new Trek hybrid bicycle. Speakers and attendees alike rode in, each in one of six area “bike trains.” This year we missed what would have been the largest group, from event sponsor Bloom Energy, as they could not attend due to a plant-wide production meeting. Attendees enjoyed light breakfast fare and coffee, supplied by the Little Goat Coffee Roasting Co., and garnered free “Bike Month Delaware 2018” T-shirts, courtesy of DelDOT in cooperation with the Delaware Bicycle Council. Dressed in her Bike Delaware jacket, Newark Mayor Polly Sierer graced the podium next and listed the number of important infrastructure improvements that will be taking place within the next several years that will enhance the bicycling experience here in Newark, already a bronze-level Bicycle Friendly Community. New Castle County Executive Matt Meyer, himself an avid bicyclist, was the event’s keynote speaker. BikeNewark Chair and event emcee, Mark Deshon, mentioned that the League of American Bicyclists had not yet released information about Newark’s most current Bicycle Friendly Community designation. Instead, Deshon pointed to a recent People For Bikes assessment and ranking of the City of Newark. The City is ranked 39th nationwide and 7th among cities with a population under 100,000 in terms of bikeability, according to data the organization gathered. State Sen. Dave Sokola (left) and BikeNewark Chair Mark Deshon (right), join John Bare (second from left), as he receives Bicycle Friendly Community Leader Award from event coordinator Mike Fortner. 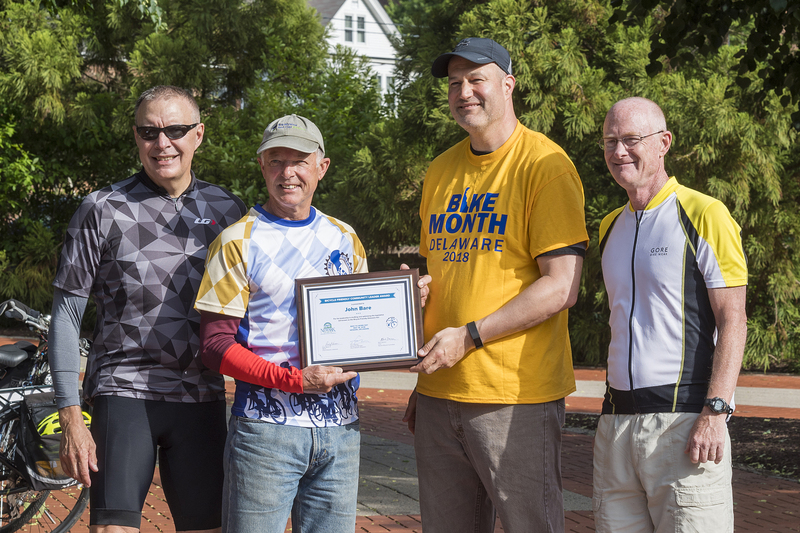 This year the City of Newark and BikeNewark presented the annual Bicycle Friendly Community Leader Award to Bike Delaware’s John Bare. Bare was chosen because of the groundwork he laid for the Bicycle Friendly Delaware Act, which was signed into law in October 2017 here in Newark. Newark-area state Senator Dave Sokola was the bill’s co-sponsor, and he spoke to the gathered attendees about the facets of the new law and added a few words about the work done by John Bare on the bill. Then Bare came to the mic and shared how this bill had been something that he’d been working toward for many years. Mary Ellen Gray was both surprised and happy as the random winner of the Trek bicycle giveaway. 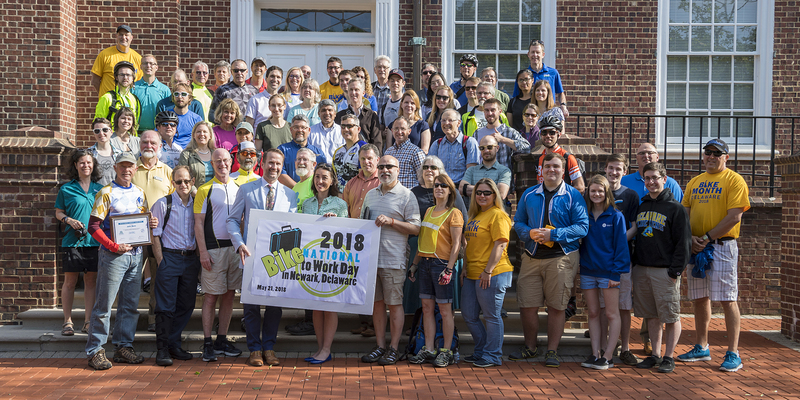 A large group photo was organized, and then event coordinator Mike Fortner, one of BikeNewark’s liaisons from the City of Newark, joined Deshon to make the morning fun by giving away a couple give certificates to local restaurants. Then, to cap off the event, the Trek bicycle winner’s name—Mary Ellen Gray—was drawn by a Trek Bicycle Newark employee and the bicycle was presented to her. 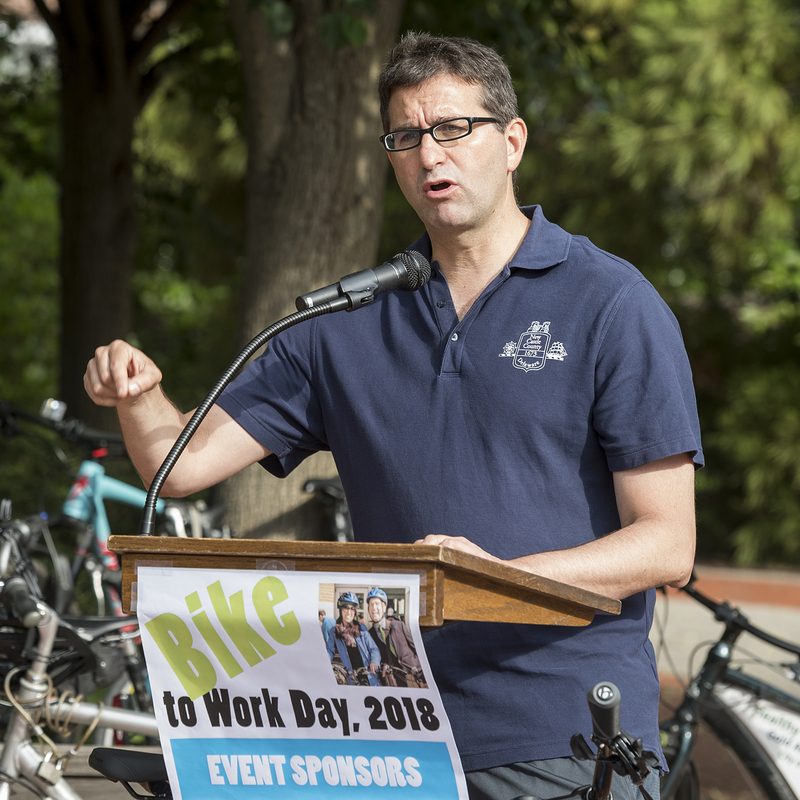 2019’s Bike to Work Day event in Newark will take place on Friday, May 17. BikeNewark looks forward to seeing you there.